Sustainable management is integral to our strategy and operations because it underpins the sustainability of Senwes as a going concern. We are committed to ensuring the sustainability of our business, while simultaneously contributing towards the continued existence of a just, equitable and stable society, as well as the preservation of the ecosystem. We do this by being conscious of our actions and the impact thereof on both society and the natural environment, and by developing strategies to ensure that we minimise negative impact and optimise positive impact. Thobo Trust is an independent trust established in 2014 to be the strategic BBBEE and Socio Economic development partner for Senwes. The beneficiaries of the trust comprise mainly of Senwes employees, farm workers, emerging farmers, and communities in the rural areas in which Senwes conducts business. Senwes’ CSI vision is to be a renowned corporate citizen that contributes to the sustainable development of communities and society as whole. Committed to the national development plan, the Senwes group aligns its initiatives with government’s development priorities. We are passionate about contributing to the sustainable development of the rural areas, especially in the areas where the Senwes group conducts business. Senwes is committed to the creation of shareholder value, the sustainability of which is based on how we conduct our business, how we treat our employees, the environment and the communities in which we operate. work in partnership with the community, government, non-governmental organisations and other businesses and in a consultative manner. Senwes seeks to develop people continuously and equip them with technical and life skills that will enable them to create and take advantage of opportunities, thereby improving their standard of living and ensuring that they experience a better future. 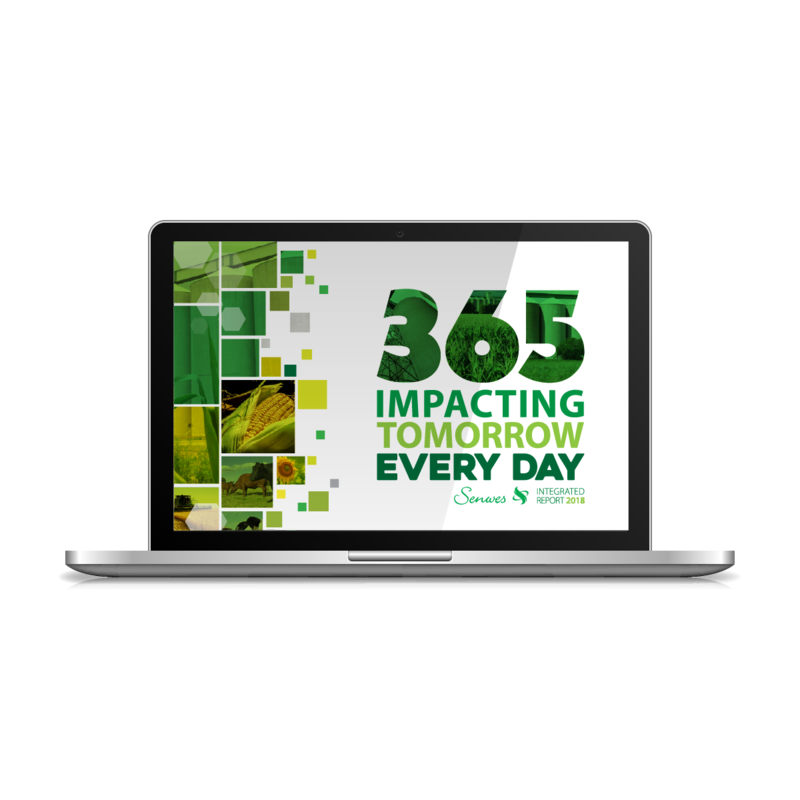 The theme for the 2018 Senwes Integrated Report is: 365 IMPACTING TOMORROW EVERY DAY. It reflects the group’s relentless approach to excellence and portrays the tireless effort which accompanies the phenomena of making sustainable contributions towards the well-being of each stakeholder group on a daily basis. The version of the Senwes Integrated Report includes the audited full financial statements (164 pages).